Attorney Chris Olsen helps victims of truck accidents collect for injuries suffered. Truck accidents cause long term damage, leaving the victim with needs that can span a lifetime. In San Diego, CA, Chris Olsen aggressively pursues full and fair compensation to ensure your needs are met. Driver negligence: Although most trucking company employees are excellent drivers that give proper, constant attention to the road while driving, occasionally an operator can lose sight of appropriate safety precautions. Failure to obey federal and state trucking regulations is considered negligence. Driver fatigue: The Federal Motor Carrier Safety Administration (FMCSA) has strict regulations governing the amount of time truck operators are allowed to drive and mandatory rest periods. Chris Olsen can research trucking company records to determine if an overworked driver is at fault for your accident. Driving under the influence: Unfortunately, some trucking accidents involve a driver who is under the influence of drugs or alcohol. For example, some truck operators take stimulants to remain alert while driving long hours. Failure to maintain the vehicle: The FMCSA has strict rules about maintenance requirements and keeping detailed service records. Mr. Olsen can thoroughly research these records and determine if a driver, trucking company, or third party maintenance company is properly fulfilling their obligations to ensure the safety of their vehicles. Overloaded or improperly loaded trucks: Improper loading or overloading can cause trucks to become top heavy and increase the risk of an accident. Failure to secure cargo can result in items falling off of a truck and cause an obstruction in the road, leading to an accident. The FMCSA has very specific laws pertaining to the proper loading of trucks, and Mr. Olsen will determine if these laws were followed. Inadequate driver training: If a trucking company knowingly employed a driver without properly training them or ensuring that the operator was licensed for commercial vehicles, they are leaving themselves open to lawsuits. 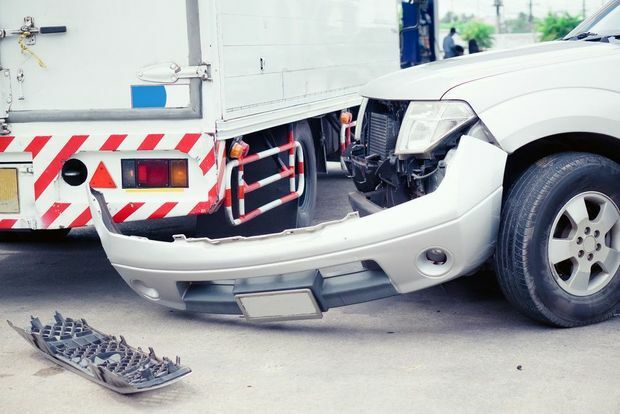 Rear-end and under-ride collisions: The weight of a commercial truck or semi-truck is far greater than a passenger vehicle, which means that a truck requires more time to stop than other cars. When a truck driver is unable to stop in time, a rear-end collision can occur. Depending on other factors such as speed and distance, a smaller vehicle can be pulled under the truck and drug for a distance before coming to rest. The damage done in a rear-end or under-ride collision ranges from severe to fatal. Head-on and side impact: A head-on collision with a truck typically demolishes the other vehicle, causing drivers and passengers to suffer severe blunt force trauma to the head and neck, broken bones, damage to internal organs, spinal cord damage, and paralysis. The same can be said of a side impact trucking accident, where a heavy truck comes into direct contact with the side of a vehicle where airbags and other safety features are lacking. Jacknife: A jackknife accident is one where a truck skids to a stop with the back end swinging to the side, wiping out vehicles in the path of the trailer. Cars can be destroyed when in the path of a jackknifing truck and those inside can be severely hurt. Lost cargo load: When the cargo of a truck spills onto the roadway, serious accidents can happen. Loads that are not secured properly can shift, causing an imbalance in the trailer, resulting in an accident. There is typically very little warning before a load spills onto the highway, leaving many motorists with little to no chance to avoid the accident. Tire blowout: The tires on a semi-truck spend a lot of time in motion, over time the tread wears down and when not properly maintained can blowout. A tire blowout can cause a truck driver to lose control or swerve into other vehicles, causing accidents with serious injury. Runaway truck: On steep declines it is important for trucks to have the ability to stop safely. When braking and other mechanisms fail to work properly, or the truck driver is inexperienced, a runaway truck accident can occur. Fast moving, heavy trucks can cause a great deal of damage to property and other drivers. If you have been involved in any of these, or another type of truck accident, it is crucial to seek immediate medical care and speak with a qualified attorney right away to protect your rights. The catastrophic injuries from a truck accident deserve specialized attention. An experienced attorney analyzes your case and demands complete reimbursement. Hiring the right attorney to take on your case after a truck accident is important for a number of reasons. A qualified attorney will know what steps to take to preserve the evidence and build a case in your favor. This includes taking photos, talking to witnesses, investigating trucking logs, and looking for signs of negligence on the part of the driver or trucking company. Also, there are a specialized set of laws that govern the trucking industry and you will want to work with an attorney who is well-versed in these laws. Our team of legal professionals is familiar with the procedures that must be followed to develop a successful strategy. Our level of experience allows you to seek maximum recovery for your injuries. In order to recover for an injury caused by another, you must first establish liability. A lack of reasonable care must be the cause of the accident and your injuries in order to lay a solid foundation for recovery. At Olsen Law Offices, we have the knowledge and experience needed to collect evidence and hold the responsible party accountable for their negligent actions. If you have been involved in an accident with a truck, contact us online, or call our office at (619) 550-9352 to learn how we can help you today.